Last night, we drove to a Rainbow brother’s property for the first time. We haven’t seen Duncan since November 2011, and I kept referring to the instructions in his message to navigate to his land. So I was surprised by what greeted us at the front gate. 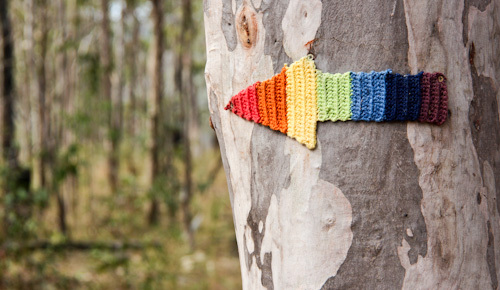 I crocheted about fifteen of these arrows late last year for the February Rainbow Gathering in Tasmania. When I asked Duncan about the arrow, he couldn’t remember exactly who had brought it to his land and left it for him. But it must have been someone who had been at the Rainbow Gathering in Tasmania! For many years, we sought to join a tribe of like-minded people so we would be part of the village that would help us raise our children. Our November 2011 encounter with a Rainbow Gathering was the first time that we met the diverse group of people who have become our tribe, and they live all around the country and the world. The last property we visited also had a Rainbow connection, and so many of the supportive relationships I have are the result of meetings at Rainbow Gatherings! Wherever we are in the country, I love to meet up with Rainbow Family brothers and sisters. As we travel in Europe later in the year, I intend to meet up with Rainbows whenever we cross paths. We returned to some different friends’ house this evening — they haven’t been to a Rainbow Gathering — but Calista offered them the highest compliment possible: “These people are Rainbow Gatheringy-type people!” That means she feels completely comfortable with them, and it’s good to be home.